KUALA LUMPUR, Sept 26 (Bernama) — The Asia-Pacific Economic Cooperation (APEC) needs to build an ecosystem that supports enterprise creation and improves the environment for innovation, as well as facilitates financial inclusion for start-ups, Deputy Minister of International Trade and Industry Datuk Ahmad Maslan said. He said Malaysia recognises the vital role of micro, small and medium enterprises (MSMEs) in bringing new ideas to the market and fostering innovation. Ahmad highlighted Malaysia’s initiatives for modernisation and automation of MSMEs, including focusing on the Soft Loan Scheme for Automation & Modernisation (SLSAM). SLSAM seeks to encourage MSMEs in Malaysia to embrace automation and modernisation of their businesses. E-commerce is another avenue to grow businesses, and both Malaysian and Chinese SMEs are taking advantage of it. THE 12th China-Asean Expo (Caexpo) in Nanning, Guangxi province concluded on Monday (Sept 21), after four days of trading and business matching. A billboard near the venue advertised: “You are just one handshake away from the market of 1.9 billion people,” referring to the combined pop­u­lation of 1.3 billion from China and 620 million from 10 Asean cou­ntries. The Malaysian pavilion was the busiest at the Caexpo. Visitors thronged the hall for the food and beverages, health and wellness products, lifestyle products and other services offered by the exhibitors. While goods changed hands and meetings between potential partners took place under the Jalur Gemilang hanging from the hall ceiling, small and medium enterprises (SMEs) were encouraged to give e-commerce a try. KUALA LUMPUR: Perbadanan Pembangunan Perdagangan Luar Malaysia (Matrade) menyasarkan untuk meningkat eksport barangan pertanian ke Turki tahun ini, diperkukuh oleh permintaan yang semakin meningkat ke atas buah-buahan tropika di negara itu. Pesuruhjaya Perdagangan Matrade di Istanbul Idzham Abd Hamid berkata buah-buahan tropika seperti nanas, belimbing dan buah naga, mendapat permintaan tinggi di Turki. Istanbul kini mengimport sebagaian besar buah-buahan tropika dari Belanda. “Kita patut merebut peluang untuk mengeksport (lebih banyak) buah-buahan tropika kita ke negara itu,” katanya kepada pemberita di uar seminar Perjanjian Perdagangan Bebas (FTA) Malaysia-Turki, di sini, Rabu. Eksport utama Malaysia ke Turki bagi tempoh Januari hingga Julai 2015 terdiri daripada barangan pertanian, dengan dagangan bagi segmen itu bernilai RM386 juta, diikuti barangan pembuatan (RM1.2 bilion) dan barangan perlombongan (RM3.3 juta). KUALA LUMPUR, Sept 22 (Bernama) — Halal Ingredients Asia 2015, touted as Asia’s first event platform for halal food and personal care ingredients industry, opened its doors on Monday. The three-day event represents the region’s best gathering and market place for halal ingredient professionals and industry players in providing thought leadership to further accelerate and enhance the development of the industry. Halal Development Corp (HDC) Chief Executive Officer, Datuk Seri Jamil Bidin, said the event would focus on several components to give a whole new perspective and opportunities via a conference, exhibition and business-to-business (B2B) networking. “It will also enhance opportunities for trade and investment as well as for local halal ingredient players to be exposed to international buyers,” he told the media on the sidelines of the event opened by Deputy Prime Minister Datuk Seri Dr Ahmad Zahid Hamidi here. Executive Director Roy Michael said that with over 600 million people and a combined gross domestic product (GDP) of 2.4 trillion ringgit ($600 billion) in 2013, ASEAN is the seventh largest market. “Should the trend continues, it has the potential to become the fourth largest market globally by 2050,” he added. He told Bernama ASEAN recorded over $1.2 trillion in total merchandise exports, making it one of the most open economic regions in the world. “Significant progress had been made in integrating the economies of the 10-member states under the ASEAN Economic Community (AEC) blueprint which is expected to be a reality by year-end,” he said. Michael was speaking after hosting the ASEAN-US Trade Winds Forum at the Malaysian embassy here on Wednesday. It was attended by American policy and industry leaders. KUALA LUMPUR, Aug 18: The success of small and medium enterprises (SMEs) is crucial for ASEAN to be truly integrated, says Deputy Minister of International Trade and Industry Datuk Lee Chee Leong. Lee said resilient SMEs should start to have a global mind-set. “They should explore opportunities from liberalisation under the ASEAN Economic Community and expand their trade and investments,” he said at the launch of I-Score credit risk management tool. The I-Score is co-developed by Rating Agency Malaysia Credit Info Sdn Bhd (RAMCI) with global information services company, Experian plc. The tool, designed for financial institutions, business corporations and consumers, provides a comprehensive credit report ranking consumers, business partners and potential investors for credit risk. Lee said SMEs could now use the tool to assess the strategies for their businesses if they intended to expand them. 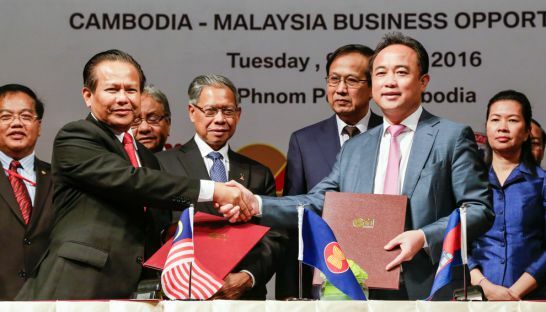 Asean countries are on track for progressive liberalisation of trade within the region, covering 128 sub-sectors via the Asean Framework Agreement on Services (AFAS). The liberalisation will boost the services sector’s contribution to the region’s gross domestic product (GDP) from the current 40% to 50%, said International Trade and Industry Minister Datuk Seri Mustapa Mohamed. He said AFAS will be a platform for services providers to take advantage of the market openings as well as to benefit from new ideas and processes arising out of the opening of the services sector. Efforts has been put into concluding the AFAS 10th package by year-end to provide wider and better opportunities for members in tapping the benefits of the services sector,” he said in his opening address at the inaugural Asean Service Provider Confederation (ASPC) meeting yesterday. KUALA LUMPUR, Sept 8 (Bernama) — The Ministry of International Trade and Industry (MITI) has teamed up with Singapore Corp Enterprise (SCE) to conduct a talent development programme for officers from MITI and its agencies. Deputy Minister, Datuk Ahmad Maslan, said the eight-month programme, from September 2015 to April 2016, was the first of its kind for Malaysian civil service and would involve 122 officers. “The platform, called the Economic Policy Leaders programme, would enhance the professionalism and charisma of the officers,” he said after the signing of the memorandum of understanding between MITI Deputy Secretary-General, Datuk Jayasiri Jayasena, and SCE Chief Executive Officer, Kong Wy Mun, here today. Also present was Temasek Foundation Chief Executive Officer, Benedict Cheong. Ahmad said the programme would be held in Malaysia and will be followed by a learning visit to Iskandar, Johor and Singapore.